Tell your doctor or pharmacist of all prescription and nonprescription/herbal products you may use before using this medication. 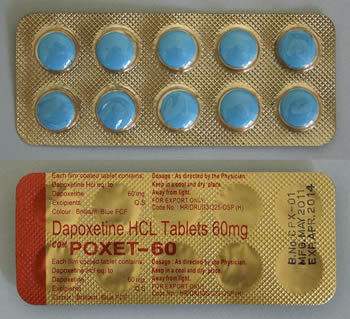 Dapoxetine can interact with: * MAO inhibitors: Furazolidone, Isocarboxazid, Linezolid, Moclobemide Tranylcypromine, etc. * Antiarrhythmic drugs: Propafenone, Quinidine, etc * Serotonin-norepinephrine reuptake inhibitors (SNRIs): Desvenlafaxine, Duloxetine, Milnacipram, Venlafaxine. * Antipsychotics (also called neuroleptics): Fluphenazine, etc. * H2-receptor antagonists: Cimetidine, Ranitidine, Famotidine, Nizatidine, etc. Turn to your doctor or pharmacist for more details.